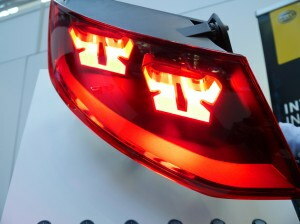 Audi demonstrated a new OLED based automobile taillight prototype. 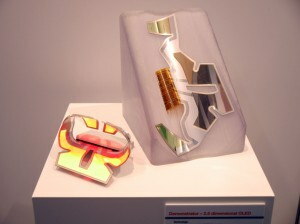 Those are flexible OLEDs that create an interesting 3D structure. The taillight was developed as part of the research project R2D2 (Roll To Device 2), funded by the German government. The luminaire was designed by Audi and built by Hella. The OLEDs are made by OSRAM. Last month Audi unveiled their new luxury electric crossover concept car, the e-tron quattro - with OLEDs in all of its displays, its frontlights and its taillights. This is just a concept car, but Audi does aim to be the world's first company to introduce OLED lighting in the tail lights of production cars (even though BMW may have just beat them to it). Audi has been playing with OLED technologies for a long time. Back in 2012 they unveiled three new OLED lighting designs, and in 2013 they unveiled 3D OLED lighting taillight prototypes (developed with Philips and Merck). In 2012 Audi also installed AMOLED digital rear view "mirrors" in their R18 sports prototype cars. Audi is also interested in flexible OLED displays. The company's latest concept, the Prologue, used bendable OLED mounted at the case of the centre console. The prototype display was made by Samsung Display, and is 8.9 x 5.6 inch in size (226.56 x 141.6 mm) and features a resolution of 2560x1600 (287 PPI). Audi says that there are only 10 such displays in existence today, this is a very early sample from Samsung. This beautiful rearlamp prototype is a result of the research project R2D2 (Roll To Device 2), funded by the German government. Osram OLED is the OLED supplier. The luminaire was designed by Audi and built by Hella. Thanks Matthias, great info and I will update my post.